These are so cute!! It's nice to remember they are still boys. It's funny that Niou and Atobe are together. 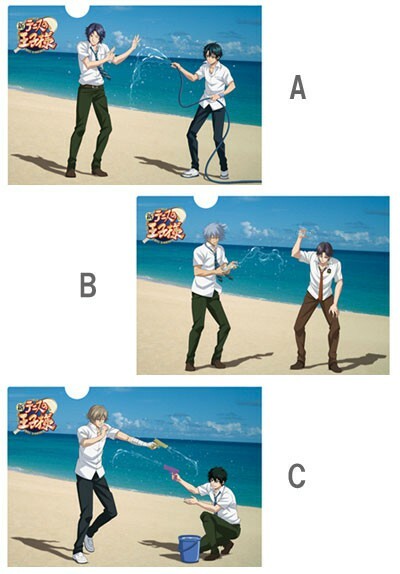 First he steals Kabaji and now he shoots water at Atobe. Ahaha! You should've let me know sooner. You and Koori, if you guys ever NOT want anything anymore, you should tell me BEFORE I buy and confirm the availability with you. I try to help you people and get things that you all want, but if you girls keep doing this to me and I will really not honor your requests anymore. I've spent a lot of money buying these you know, I don't have much money to just buy and let stuff sit there. "Sorry" doesn't help me get my money back. All of your comments are above. It's not necessary, I will try to sell it myself, I don't want to sell it to you if you don't really want it. Please make sure you actually leave a message to let me know if you don't want something anymore, but please do so BEFORE I confirm that I have purchased it. Will you ever have them for sale? I will, they will be here next week or so =) I always sell my clear files for $15 each, and $17-$18 for really rare ones. Are you interested? Yeah, I'm interested.^^ can it be shipped with the other items I ordered though? Sure, lemme check what you have on hold, if they are flat items then they can be sent together, otherwise they cannot, because I don't want to ruin the clear files sending it in a bulk package.